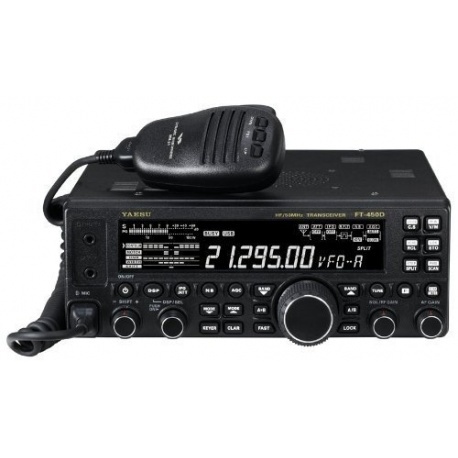 The transceiver Yaesu FT-450D is the improved version of the famous Yaesu FT-450AT. It covers all HF radio bands from 160m to 10m as well as the 6m band (50 MHz) with a power of 100W in SSB. Comes complete with: FT-450D HF 100W, MH-31 A8J hand-held microphone, power cord with fuse, user manual in French. Description: The transceiver Yaesu FT-450D is the improved version of the famous Yaesu FT-450AT. It covers all HF radio bands from 160m to 10m as well as the 6m band (50 MHz) with a power of 100W in SSB. Reception from 30 Khz to 56 Mhz Emission all bands radio amateurs HF Dimensions in mm 229 x 84 x 217 Weight: 3.6 kg Comes complete with: FT-450D HF 100W, MH-31 A8J hand-held microphone, power cord with fuse, user manual in French.